No sleep for 36 hours...waiting in the office for a phone guy to hook up a new net connection...gotta get out of here! 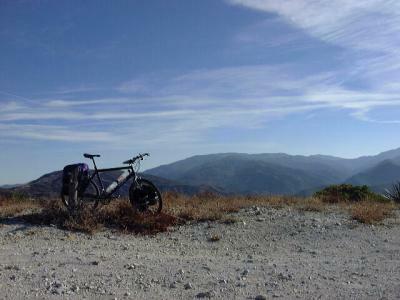 Leaving the San Fernando Valley via the Newhall Pass is a tricky prospect by bicycle. A series of hills increasing in height test your commitedness to the ride. The largest of these hills lies along Sierra Highway between the I-5/CA-14 interchange and San Fernando Road in Newhall. Once you've killed this hill, the going is easy for a while. 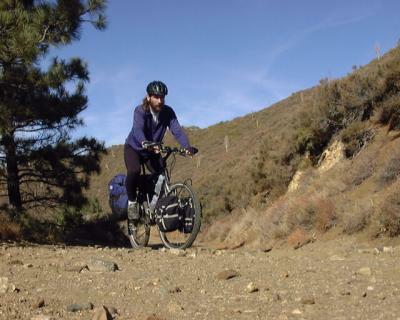 After enjoying the smooth downhill capabilities of an overloaded bicycle, I made a right turn on Placerita Canyon Road and began the up-and-down grind over to Sand Canyon Road and Live Oak picnic area. I rested for a while at Live Oak, listening to crows converse, children screaming down in the dry wash, now and then a Harley roars by on the twisty road. The clouds and haze impart a forlorn look to the dunn-and-brown landscape. I finished my lunch and packed up. Only a couple hours of daylight left, and miles of steep climbing, prompted me in to action. The going was slow, but thankfully I've got a magical drivetrain! As I climbed up the canyon, I looked down into dry streambed and stands of sycamore and maple, the former turning brown, the latter turning lemon yellow with autmn chill. 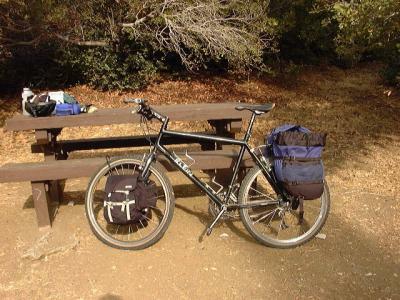 I reached Bear Divide Saddle, and stopped at the picnic area to tank up with water. For cyclists travelling east from this point, this is the last water until the Indian Canyon Road, about 6 or 7 miles distant. I had recently purchased a DromLite water bag (MSR) and had yet to 'field test' it. I filled the thing to the brim - 1 gallon - and strapped it to the top of my rear rack. It seemed stable and secure, but looked like a giant purple amoeba rinding on the back of my bike. Miles...and miles...and miles... I ground up the Santa Clara Divide. At this point the road is paved, but rough and steep. A couple motorcyclists passed and waved. They were going downhill...lucky bastids!! As I climbed the switchbacks at the foot of Magic Mountain the sun began to sink into the thick cloud layer on the western horizon. I began to look for a campsite. Since I was traversing a steep mountainside, none were readily apparent. As the sun finally sank below the horizon, I reached the first stretch of dirt road, then reached the southeast ridge of Magic Mountain. I got off the bike and hiked a few yards down-ridge from the road, where I found a nice bivy site in a stand of yucca and chapparal. I fetched the bike and set about unpacking. I scraped the gravel from a flat spot and laid out my bivy sack and my ThermaRest pad. I whipped up a dinner of RichMoor vegitarian lasagna, which turned out to be quite delicious and satisfying for freeze-dried fare. After I had finished dinner and a little dessert, I laid down and watched the stars as they were unveiled for the night. The Leonid meteor showers were in full swing on the other side of the globe, but seemed to be spilling over a little onto this side. I saw some uncommonly bright meteors, and more than are usually spotted so close to town. I awoke to airplane noise. Los Angeles has numerous small airports, and lots of small airplane traffic. After a quick breakfast, I was on my way. I rounded a corner onto the east face of Magic Mountain and got a good view of my objective, Mount Gleason, still many miles to the east. A light haze had settled into the contours of Pacoima Canyon, and long streamers of cloud textured the brilliant blue morning sky. I descended from Magic Mountain and continued my trek along the backbone of the Santa Clara Divide. An hour of smooth riding brought me to the Indian Canyon Road. Here I turned left and descended about 1/4 mile to a reliable spring, where I refilled my 1-gallon amoeba. I sat in the peaceful shade, with pines and oaks and maples all around, and enjoyed the quiet morning long enough to gulp some water and a Clif bar. The spring in Indian Canyon is the last reliable water near the ridge, so from this point forward I had to ration my water carefully. I returned to the Santa Clara Divide Road and slogged over yet another mountain and on to the North Fork Saddle ranger station. I had hoped there would be water here, but, as I expected, there was none. From North Fork Saddle, the rest of the road is unpaved. I let a little air out of each tire and bounced on up the road. A set of shaded switchbacks lead up the mountain. Soon I turned a corner and began a long traverse of the southern slope of the ridge. The author, actually riding the bike! 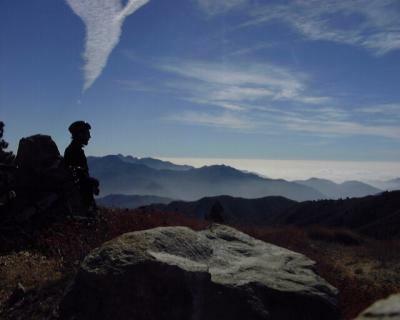 The drab desert foliage nearby was offset by dark mountains and verdant canyons, and a sea of low clouds obscuring the Los Angeles basin and the inland valleys. Before too long I was at Moody Canyon Saddle. The Moody Canyon Road drops off the ridge to the north here. This is another of my favorite rides in this area. I took a break and ate some lunch, enjoying the gentle breeze and mild autmn sunlight. Near sunset I passed the Messenger Flat campground, a small camp in a grove of jeffrey pines and live oaks. There was only one person camped there, and no water to be had. I continued, now climbing steeply through the pine forest. After a short traverse through more chapparal, I reached the saddle where a spur road leads south to Lightning Point group camp. I headed to the camp to search for water, but when I got there I found a campsite I liked. The water system had been shut off for the year, and all the spigots removed, but some of the pipes still had water in them. I had plenty of water left, but it was good to know there was a little about in case of an emergency. I brewed up some coffee and set about cooking dinner. 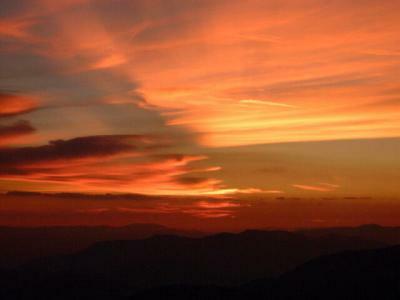 The sunset, though colorful, was not nearly as nice as on the night before. While I sat there cooking, a large bird began to squawk and make cat-like noises from a nearby tree. I walked over to investigate, but the sound moved off into the distance. I could only guess that it was a hawk or a golden eagle trying to scare me away from it's nest. I went back to camp and finished dinner. After dinner and some more stargazing, I hit the sack and tried to read a book. I don't think I got through one chapter before I dozed. When I awoke, I couldn't remember where I had left off, so I closed the book and crept deeper into my sleeping bag, and slept soundly. The next morning I awoke to a cold breeze. The clouds had welled up around the mountains, and cold moist air was being carried up over the mountain on a steady wind. I lay in my warm sack for a while. Soon the 'call of nature' rang out clearly, so I got up...and out into the cold air! I packed up and prepared to descend, but I wanted to be able to claim a complete descent of Mount Gleason, so I had to backtrack and do the 1/4-mile climb to the true summit, at 6,500' elevation. After enjoying the view, I returned to the entrance to the group camp. Here, a dirt road branches to the southwest. This is the start of the Mendenhall Ridge Road, which descends nearly 5,000 feet to the Little Tajunga Road at Mendenhall Saddle. As I descended I was reminded why I like riding a fully loaded bike - this sucker was really sticking to the road!! I was a bit concerned at first that I might break a wheel, but the bike seemed to absorb most of what it hit. The first few miles of road traversed a densely forested mountainside. The air was cold and still, so the occasional sunny spots were much appreciated. Before long the forest shrank to scrubby oak trees about head-high. 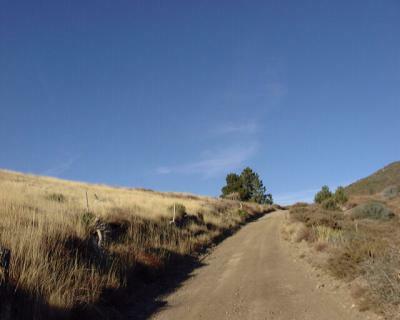 The complex and rugged void of Pacoima Canyon was on my right. I had an opportunity to take a route through the canyon, but I had been down there before. Memories of rocks, stream crossings, and generally rough road convinced me to stay on the Mendenhall road. As I neared the end of the road, I passed the occasional bay tree. I stopped at one, picked a leaf, crushed it between thumb and finger, then inhaled the aromatic (and allegedly theraputic) vapors released - REFRESHING!! I grabbed a stalk of several leaves and stashed them in my pack for later. When I reached the Little Tajunga Road, I decided to avoid the city for a while longer. I went right instead of left. 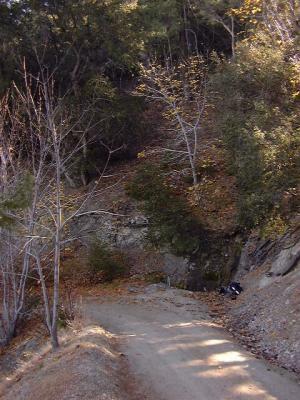 A screaming descent lead down into the inhabited depths of Pacoima Canyon, just above the Pacoima Reservoir. I rolled on through the canyon, through groves of live oak, sycamore, and maple. A hint of smoke on the air spoke of a fire in a wood-burning stove, someone doubtless sitting comfortably by, drinking coffee and reading the paper...ah, that's the life! I climbed over the Bear Divide and plunged down to Live Oak picnic area, where I again stopped for a rest before finishing the long road grind home over the Newhall Pass. And well formatted. I'm sure if we had featured trip reports on MbPost, this would certainly make it. Quite a fun read!